Tonatiuh Mejia, vice-director of administration at CF Monterrey, confirmed that the speed of construction works at the club’s future stadium is very good. The arena for 50,000 people is now over 80% ready. All of the concrete structure is in place, while steel roof frame is nearly complete. Another step will be covering the entire venue with aluminum sheets. 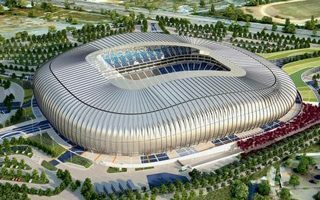 Together they will form the outer shell of the stadium with distinctive expanses resembling shark’s gills. CF Monterrey has already supplied all necessary equipment, however to date it’s been stored off site. Installation of seats, giant screens, lighting and various systems won’t begin until the roof is ready. Initially the stadium, which saw groundbreaking back in 2011, was scheduled to open in Spring of 2014. However, having suffered from significant setbacks in early months, it’s now expected to be ready in the Spring of 2015.